In one of the few emotional moments in his seventh state of the nation address, Putin used a fairy-tale motif on the need to build a fortress-like house to withstand the advances of a voracious wolf to illustrate Russia's own need to bolster its defenses. He also suggested that Washington puts its political interests above the democratic ideals it claims to cherish. "Where is all this pathos about protecting human rights and democracy when it comes to the need to pursue their own interests? 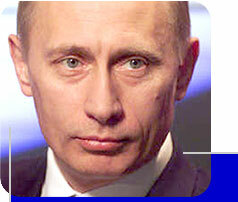 Here, it seems, everything is allowed, there are no restrictions whatsoever," Putin said, smiling sarcastically. "We are aware what is going on in the world," he said. "Comrade wolf knows whom to eat, he eats without listening, and he's clearly not going to listen to anyone." The wolf reference was a response to the "United States, its actions in Iraq and plans toward Iran, its games on the territory of the CIS (former Soviet territory) and its criticism of Russia," analyst Alexei Makarkin told Ekho Moskvy radio. Putin's speech came close to a week after Cheney accused Moscow of rolling back democracy and strong-arming its ex-Soviet neighbors. In another apparent barb aimed at the United States, he said countries should not use Russia's World Trade Organization membership negotiations to make unrelated demands. "The negotiations for letting Russia into the WTO should not become a bargaining chip for questions that have nothing in common with the activities of this organization," Putin said. In April, U.S. senators visiting Moscow said Russia's democracy record and its stance in the Iranian nuclear crisis would influence Congress as it considers Moscow's bid to join the global trade body. Nationalist legislator Alexei Mitrofanov told reporters in the Kremlin that Putin's Russia was in no way looking for a confrontation with the West, "but we want to be a politically and economically independent state." Putin pointed out that Russia's military budget is 25 times lower than that of the United States. Like the U.S., he said, "we also must make our house strong and reliable." "We must always be ready to counter any attempts to pressure Russia in order to strengthen positions at our expense," Putin said. "The stronger our military is, the less temptation there will be to exert such pressure on us." Putin said the government would work to strengthen the nation's nuclear deterrent as well as conventional military forces without repeating the mistakes of the Cold War era, when a costly arms race against the U.S. drained Soviet resources. He said Russia would soon commission two nuclear submarines equipped with the new Bulava intercontinental ballistic missiles, the nation's first since Soviet times, while the land-based strategic missile forces would get their first unit of mobile Topol-M missiles. The new missiles and warheads, which can foil defenses by changing direction in flight, would allow Russia to preserve a strategic balance without denting the nation's economic development goals, he said, adding that Russia needs a military that is capable of answering all modern challenges. Two-thirds of the army will be professionals instead of conscripts by 2008, he pledged, allowing the state to reduce the length of obligatory service from two years to one, and close to 600 rapid-response units will be formed by 2011. "We need a military that is able simultaneously to carry on battle in global, regional and, if need be, several local conflicts," he said. The military should be able to guarantee Russia's territorial integrity, he said, a reference to the threat of Islamic extremists in southern regions surrounding Chechnya. He said the threat of terrorism remained significant, and that "extremists of all stripes" feed off of local and religious conflicts. "I know that someone very much wants Russia to get bogged down in these problems and, as a result, to be unable to solve a single one of its problems of full-scale development," he said darkly without identifying the foe. Putin called the demographic slide that has shrunk Russia's population by millions since the 1991 Soviet collapse "the most acute problem of contemporary Russia," and encouraged legislators to budget for more generous birth bonuses, childcare support subsidies and educational benefits for mothers to encourage women to have children. "I am convinced that with such an approach, you will earn words of gratitude from millions of mothers, young families, all the citizens of our country," Putin said. He also called on more Russians to take in foster children from institutions where about 200,000 orphans and abandoned children are interned. Russia's population dropped by about 4 percent to 142.7 million between 1993 and 2006, according to the Health Ministry. Experts attribute the plunge to post-Soviet economic turmoil that has badly hurt the state health care system, leading to a drop in birth rates and life expectancy. Increased poverty, alcoholism, soaring crime and emigration have also taken their toll, leading to an average life expectancy of just 66 years - 16 years lower than Japan and 14 years lower than the European Union average.